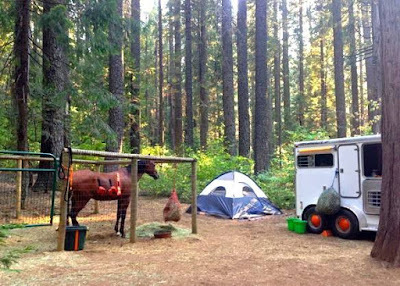 When Horse Camping, your options for where to keep your horse are almost as varied as your own sleeping options. In addition to budget and storage concerns, you’ll need to keep in mind your horse’s training level and what they’ll accept when deciding where to put your horse overnight. 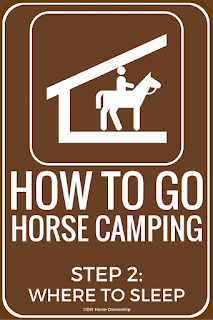 Probably the easiest option is to find a campground that comes with corrals for your horse. This way you don’t need to haul any additional equipment or worry about training your horse to deal with other options (like high-tying). Many equestrian campgrounds do provide corrals. However, the quality of those corrals can vary wildly. For example, the corrals at Skillman Horse Camp are maintained by a dedicated group of volunteers. The corrals are spacious, have high fences, and no-climb wire. Staying here requires very little in additional equipment; you’ll just need a bucket for water and (optional) hay nets. However, I have been to equestrian campgrounds where the corrals are not well maintained. Several times we have found the corrals to be filled with weeds that need to be ripped out. We have also frequently found the pens to not have any chains for keeping the gates closed. In some cases you can use your halter to make a make-shift closure, but I would recommend bringing a chain and clip for each corral you’re going to use. Some campgrounds may have a group of corrals available to the whole campground on a first-come first-serve basis. Even if you get a corral, it may not be next to your campsite. You may also want to consider how your horse will react when stabled next to strange horses and you’ll definitely want to make sure you’re up-to-date on all your vaccines. Unless I’m camping with other people I know, I prefer not to keep my horses in corrals near strange horses. It’s not worth the potential injury and illness risks to me. Other people have no problem with it though. Just do your research before you leave to know what your corral situation will be. There are several different brands and manufacturers that make portable corrals. You can even get them in custom colors, like the pink ones pictured below. Some of the lighter weight panels can be mounted to the outside of your trailer for transportation to and from camping. Others can be kept inside a spare stall in the horse trailer. You may be able to get these mounted to your trailer’s roof, store them in the bed of your truck, or even get them into your trailer’s tack room. I have seen some pretty clever solutions for transporting portable corrals. Portable corrals also offer options in how you set them up. Some attach directly to your trailer, while others can be set up independently. If you have multiple horses, some people keep them all in one corral, while others make multiple connecting pens, or even multiple separated pens depending on the horses. While having your own corrals can be great, one of the big downsides is weight. These panels can be heavy. In addition to considering the additional weight when towing, you need to think about your own strength. You’ll need to pick these up, move them around, set them up, and put them back. If you have a bad back or just aren’t very strong, it can be difficult to wrestle heavy corrals around. Lightweight corrals tend to cost more and I have heard of horses breaking, bending, or even breaking through flimsier panels. A lot of people horse camp with portable electric fences. They’re lightweight, take up almost no storage space, and can allow you to create a fairly large space for your horse. They also can be fairly affordable, especially in comparison to portable panels. However, you do need to be sure your horse will respect the fence. I cannot tell you how many horror stories I’ve heard about horses breaking out of these and running through camp getting other horses riled up. I know for sure that one of my horses will walk through electric fences. She squeals and pins her ears, so I know the fence is working, but she cares more about the grass on the other side than any pain the fence can provide. These fences can also require some maintenance and different styles operate on different types of batteries. Some operate on solar charge, which could not work if it’s raining or you’re camped in a heavily shaded area. Others can run off of batteries or even be plugged in to an electrical source. Know how yours works and test your horse in it at home before heading out to go Horse Camping for the first time. The traditional back-country highline can be used in a campground as well. 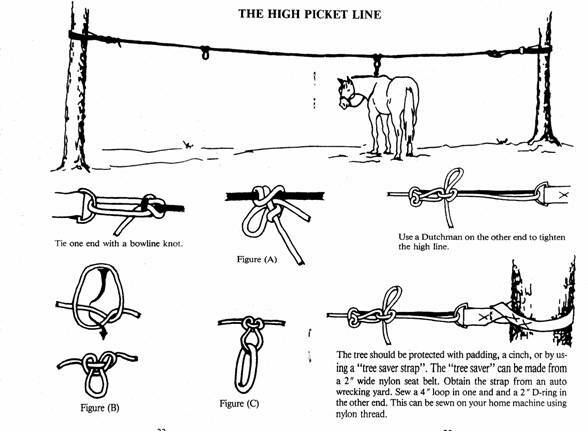 If you’re interested in this method, here’s an article from Horse and Rider on how to tie a highline. Some people put together their own ropes and use lead lines, but there are complete packages available for purchase with tree guards, lines, clips, ropes, and everything you need to set up a highline. If you’re interested in high-tying, make sure the campground you’re going to allows highlines; some don’t to protect trees. 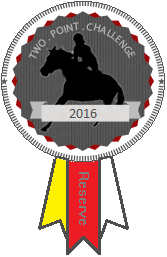 This is another method that really depends on your individual horse, his preferences, and his training. If your horse doesn’t like to stand tied or likes to pull back, this is not the way to go. I would recommend trying this out at home before you end up stuck at a campground for the weekend with a horse you only just learned that you can’t leave tied. If you don’t want to go to all the work of setting up a highline when you camp, there is a modern equivalent. High Tie systems can be installed on your trailer that you can tie your horse to. I personally have used EasyCare’s HiTie system, although other systems are available on the market. I have even seen some people with welding skills who’ve made their own. The biggest convenience to these is that, once they’re installed, they can be set up in less then a minute. One of the things I really like about the HiTie system is the bungee rope. This lengthens to let your horse graze, lay down, or even roll, but shrinks back up so the rope isn’t at a tripping length when the horse is standing normally. My mule is obsessed with rolling. I usually walk her away from the trailer to roll after a ride, but sometimes she just has to roll before I’ve finished putting all the tack away. I’ve also found that the bungee helps with pulling back because the elastic really takes the pressure off. If your horse likes to paw or dig holes when tied, you may want to consider hobbling them. In addition to stopping them from destroying your campsite and tiring themselves out, if the campground is secluded/safe enough, you can turn your horse out for some grazing time. Make sure to properly train your horse to hobble before using them. A horse could be seriously injured otherwise. Thanks for the great articles. Sadly, our state parks don't allow you to use electric fence at their campsites. I like the concept of the portable panels, but some horses figure out how light it is and I've seen them push on it and move it to get to the grass. Or get their heads through and spook, almost taking the panel with them. Yeah, I've seen all those problems with the light-weight panels. They make heavy duty corral panels, but then you're lugging around heavy panels so it's a trade off.